﻿Sandi Selvi is a comedian, writer and Bay Area native. She has been delighting audiences with her wit and insight at places like the Improv, Rooster T. Feathers, the Comedy Store, Caroline’s on Broadway and many other venues since her successful stem cell transplant. Magazine and newspaper articles have been written about her life and sense of humor, and she was featured in the movie Comedy, Ain’t for the Money. ﻿A personal journey of a mom who battled multiple sclerosis, and won! After being diagnosed with MS in 1995, Sandi Selvi began to decline rapidly and quickly became frustrated with conventional medical options. The drugs had nasty side effects, and in her case, the drugs didn’t work. So, in March of 2000 Sandi joined forces with the brilliant doctors at Scripp’s in San Diego, to, as they so eloquently put it, “Kill her immune system and build a new one” with an autologous stem cell transplant. Theoretically her new immune system could stop the MS.
During the two month medical procedure Sandi came pretty close to death, but a $10.99 box of used comedy tapes helped her through recovery, and changed her life. 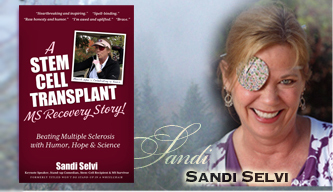 Laughter is indeed the best medicine—Sandi now shares her medicine, and her medical miracle, through stand-up comedy.